KUALA LUMPUR, 31 Mei 2012- The National University of Malaysia (UKM) has been ranked among the world’s top 50 universities established within the last 50 years. It is the only university from Malaysia that made it in the QS Top 50 Under 50 list ranked in the 31st place. UKM has also made it into the Times Inaugural University ranking top 100 under 50. 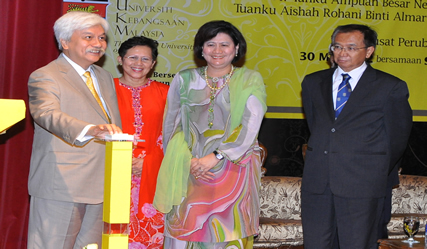 UKM is ranked 98th place in the 100 best universities in the world established within the last 50 years. Vice Chancellor, Prof Tan Sri Dato’ Wira Dr Sharifah Hapsah Syed Hasan Shahabuddin who announced this at the 40th anniversary of the medical faculty here yesterday said “success will not last if efforts to defend and improve our position is not made”. 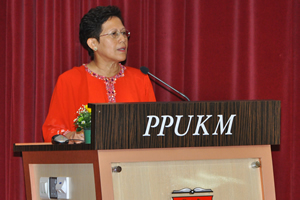 She paid tribute to the Medical Faculty which had played its role well ever since UKM was afforded the status of a research university. The medical centre in the Medical faculty have also made it to the headlines for its breakthroughs and services. The Centre of Tissue Engineering succeeded in culturing human tissue while its Medical Centre has been able to provide a revolutionary stroke care that focuses on reversing stroke attacks in patients. The UKM Medical Centre (UKMMC) has performed the ‘minimally invasive’ surgery on a 14 day-old baby to remove 95 per cent of his pancreas making the surgery (pancreatectomy) the first of its kind in the world done on a baby that young. The 40th anniversary celebrations also witnessed the launching of the Integrated Patient Information Centre. Patients can access jargon free and user friendly medical database to find out about illnesses and treatment methods on touch screen LCD display. It will help the public and patients to be more medically conscious and keeping them occupied while waiting to see the doctor. Present at the event was the Chancellor, Tuanku Muhriz Tuanku Munawir; the Tunku Ampuan Besar Negeri Sembilan, Tuanku Aisyah Rohani Tengku Mahmud, Deputy Vice Chancellors, Deans of Faculties and Head of Departments.